The horrific attacks in Paris have intensified ongoing discussions about the American strategy for combatting ISIS — or “ISIL” or “D’aesh. (See: Why John Kerry and the French president are calling ISIS “Daesh.”) It has also brought some to express concerns about refugee resettlement policies for those fleeing ISIS, ongoing human rights violations in Syria, and US intelligence capabilities in the region. While there will be ongoing debate about the extent to which refugee policies, domestic threats, and military strategy intersect, the issues are already intersecting within the U.S. political debate. H.R. 4038: To require that supplemental certifications and background investigations be completed prior to the admission of certain aliens as refugees, and for other purposes. H.R.4033: To temporarily suspend the admission of refugees from Syria and Iraq into the United States and to give States the authority to reject admission of refugees into its territory or tribal land. H.R.4032: To amend the Immigration and Nationality Act to provide for a limitation on the resettlement of refugees. H.R.4031: To prohibit obligation of Federal funds for admission of refugees from Syria, and for other purposes. H.R.4025: To prohibit obligation of Federal funds for admission of refugees from Syria, and for other purposes. H.Res.528: Expressing the sense of the House of Representatives regarding the Victims of the Terror Protection Fund. Last Friday, the U.S. conducted an airstrike in Libya, killing the leader of ISIS in Libya. The airstrike marked the first time the U.S. directly attacked an ISIS target in Libya. “It demonstrates that the United States will go after ISIL leaders wherever they operate,” a Defense Department spokesperson explained. Beyond the question of strategy, there is also the question of the President’s authority to undertake military in the region. On November 10, Deputy Special Presidential Envoy For The Global Coalition To Counter ISIS, Brett McGurk, spoke before a Senate briefing, saying that President Obama did not need additional authority to take on ISIS. HRes. 139: Condemning violence against religious minorities in the Middle East and any actions that limit the free expression and practice of faith by these minorities. [T]hat: the United States should urge the government of Syria and other parties to the civil war in Syria to implement an immediate cease fire and engage in negotiations to end the bloodshed; the United States should declare that it is a requirement of basic justice that war crimes and crimes against humanity, whether committed by officials of the government of Syria or other parties to the civil war in Syria, should be investigated and prosecuted; the President should direct the U.S. representative to the United Nations to promote the establishment of a Syrian war crimes tribunal; the United States should continue its efforts to collect and analyze documentation related to ongoing violations of human rights and make collection of information that can be supplied to a Syrian war crimes tribunal a priority; in working with other countries to establish a Syrian war crimes tribunal the United States should promote judicial procedures that enable the prosecution of the most culpable persons guilty of directing such crimes; the United States should urge other interested states to apprehend and deliver into the custody of a Syrian war crimes tribunal persons indicted for war crimes or crimes against humanity in Syria, and urge such states to provide relevant information to the tribunal. Under the new plan, the limit on annual refugee visas would be increased to 85,000 in 2016. The cap would then rise to 100,000 the following year. Eighteen US Mayors signed a letter in support of the President’s plan, indicating that their cities welcomed refugees. Despite the push-back, Administration officials have said that the new plan will proceed. Congressional Democrats are rallying around the President’s plan. According to the Huffington Post, House Speaker Paul Ryan may move legislation regarding Syrian refugees through the House as early as this week. Limits on refugee policy as part of spending bills? Below, we highlight pending bills on the topic. But first, some background about the current policy. Internally Displaced People (or IDPs) are forced to flee due to war, conflict or persecution and move into safer areas within their country. Immigrants are people who leave their country by choice. They choose to live somewhere else for any number of personal reasons. Migrants also leave their country by choice, in order to improve their livelihood, usually for economic reasons. 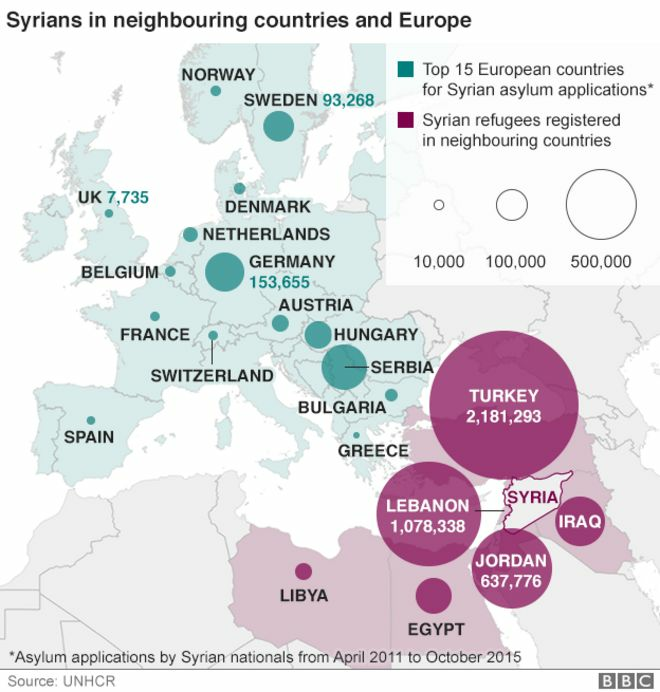 How do refugees enter the United States? A person must be referred by the U.S. Refugee Admissions Program (USRAP) for consideration as a refugee (USRAP processes referrals from the State Department, UNHCR, Resettlement Support Centers, DHS, Department of Health and Human Services/Office of Refugee Resettlement, International Organization for Migration (IOM), and non-governmental associations like the International Committee of the Red Cross (ICRC). Refugees then undergo additional security checks, a medical check, are matched with a voluntary local sponsor agency, and given cultural orientation. Before departing for the U.S., refugees are given an additional pre-departure security check. H.R. 2839: To reform and modernize domestic refugee resettlement programs. H.Res. 435: Recognizing the persecution of religious and ethnic minorities, especially Christians and Yezidis, by the Islamic State of Iraq and the Levant, also known as Daesh, and calling for the immediate prioritization of accepting refugees from such communities. the scale and complexity of the Syrian refugee crisis and the need for the international community to work together to provide resources and capacity to aid refugees; the humanitarian commitment of Syria’s neighbors who have worked to absorb the vast majority of refugees, as well as the European nations who have made commitments to share in the refugee resettlement effort; and that the refugee crisis is a symptom of the broader conflict in Syria, the persecution of persons based on identity groups, including Christians, Yezidis, Turkmen, and Kurds, and instability in the Middle East and North Africa, and that efforts to resolve those challenges are a necessary component of any plan to address the refugee crisis. Welcomes the President’s decision to admit at least 10,000 Syrian refugees in 2016, and to increase the overall number of refugees received by the United States to 85,000 in 2016 and 100,000 in 2017. We will update as new bills are introduced.